Wallace Stegner (1909–1993) was born near Lake Mills, Iowa, and grew up in Saskatchewan, Canada; Great Falls, Montana; and Salt Lake City. He spent nearly twenty years in Salt Lake, from 1921 to 1937, and attended East High School and the University of Utah. He later taught at the University of Wisconsin, Harvard, and Stanford. 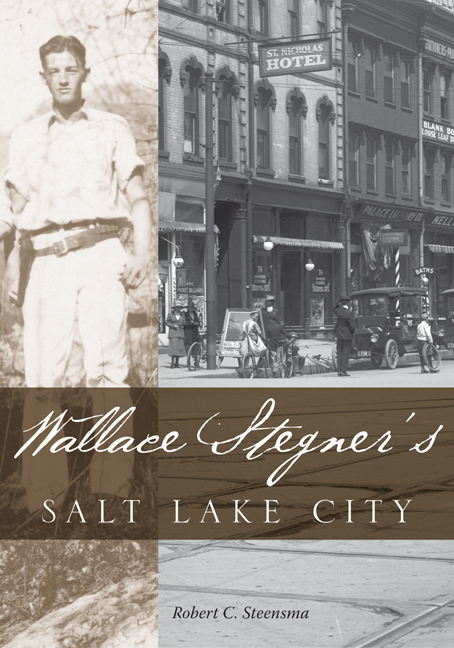 Robert Steensma has meticulously searched through archival photographs, quotations from Stegner’s writings, and interpretive essays in order to recreate the Salt Lake City of the 1920s and 1930s, the city of Stegner’s youth and young adulthood. This is a book that will appeal to all who have been moved by Stegner’s novels, nonfiction, or his urgent appeals for conservation. Robert C. Steensma is emeritus professor of English at the University of Utah.